This is part of the joint effort of Zero Stray Pawject and the Municipality of Aegina to microchip all dogs who live on the island. Microchipping and registering is required per law 4039/2012 and 4235/2014; violators can be fined EUR 300. So be a responsible owner: microchip your dog, avoid the risk of a fine, and best of all, have the chance to win 200 EUR every 2 weeks! This subsidy program is in addition to the ongoing Lottery program, which started in February 2018, to reward responsible owners who microchip their dogs. Welttierschutzgesellschaft e.V. (WTG) is a Berlin/Germany based registered non-profit organisation. Their vision is a world, in which animals are appreciated by people, treated according to their needs and with respect. In their work for animal welfare WTG focuses on countries and regions with little protection for animals. They aim at improving the situation for animals in the long term i.e. by providing veterinary care, by supporting animal sanctuaries and through our educational work. WTG cooperates with local partner organisations and involves the people who are directly concerned. 2018 was a year full of milestones on our way to achieving zero stray dogs in Greece. We started our initiative to decrease the number of stray dogs in collaboration with the municipality of Aegina with early successes. We also worked at the national level to lobby for public policy and legislative changes. From setting up the first ever enhanced municipal dog registry for the municipality of Aegina, to de-anonymizing owned dogs to stop its abandoning, to financing a lottery, to financing a lottery to get people to microchip and register their dogs for the municipality, to sponsoring municipal dog tags. 2018 was a great year! We cannot succeed without the continued support of our partners, our supporters, and our friends, so we wanted to say a big THANK YOU for helping us to achieve zero stray dogs in Greece!! ZSP is a small rescue organization, but still made the impossible possible and found six dogs that were deemed non-adoptable, and were expected to live to the end of their days in a shelter, with loving homes in 2018. Some of those dogs had waited for up to four years in the shelter. Two other dogs were taken in a "mission impossible" off the street, involving many amazing people. Zero Stray Pawject’s approach to solve the stray dog problem by de-anonymizing the owner-dog relationship is starting to get media attention. We also had the opportunity to share our core value and belief that zero strays can only be achieved in communities where there are strong animal welfare organizations and volunteers and a supportive mayor. As such Aegina is recognized for being a leader in Greece and a shining example of how different stakeholders can band together for the common objective of zero strays. The article is widely shared across various news channels in Greece. Zero Stray Pawject is proud to introduce its new advisory board. Our goal is the reduction of stray dogs to zero in the regions that we operate in. Achieving this goal requires solving tough public policy problems. We are delighted to welcome to our board thought leaders and problem solvers who are on their own right global leaders in animal welfare, public law and animal rights, and global business. Each of our board members believe in our vision, our operating model, and our public policy work. They have been providing their guidance and advice informally for many months. We look forward to many inspiring exchanges as we work together to solve the stray dog crisis! ZSP spent a productive day in Aegina today. We met with all four vets: Despina, Giannis, Maria, and Nektarios to update them on the latest progress on Aegina’s Zero Stray Program "The Pawject" as well as the longer term goals towards achieving Zero Strays on the streets of Aegina. We also met with our main partner in the Municipality, Sofia Hatzina, to discuss our shared insights after the first 4 months of the Municipal Microchip Municipal Dog Registry. Earlier in the day we had a chance to spend time with Elizabeth and her husband Paraskevas from AAPA, as well as Alexia at Vouvra Farms. Days like this are inspiring. To spend time and exchange perspectives with all the key players who are all working together towards the same goal of Zero Strays and all of us trying to contribute on our part of the puzzle. Below is a picture at the main entrance to the Municipal Building on our joint effort to microchip and register Aegina’s dogs. June 20th - 5 more lucky winners in Aegina ! Five more lucky winners in Aegina! Five more responsible dog owners who microchipped and registered their dog according to Greek law 4039/2012 and 4235/2014 who all won EACH 200 EUR!!! Moca, Irma and Remi are all amazing dogs and had no chance of getting adopted due to breed (pitbull mixes and mastifff mixes), as well due to older age and medication needs. With the incredible efforts of Zero Stray Pawject's team, we managed to place all three of them into loving homes after very careful vetting. Irma with the saddest eyes we ever have seen moved to Eliana and Alastair and their two small children and their dog. Eliana even traveled all the way to Greece to pick up Irma. Irma since has been thriving in her new home and she does not have sad eyes anymore. Remi is an amazing boy full of energy, a cancer survivor who has to take ongoing medication. We found Janet who lives on a 4 acre farm and who fell in love with Remi. ZSP even purchased a CR82 kennel to enable the transport of Remi into his new home and since Remi has been a very happy boy. You can read about many of his adventures on Facebook and Instagram, for example his travel upstate, his first visit to a pet store and general photos of him being adopted. Moca is the sweetest dog but had some leash aggression and in combination with the stigma attached of being a pitbull mix, it made it more difficult to place her. She finally got adopted after a creative marketing approach and careful vetting. We found experienced owners and Moca moved into the best family ever and who are making anything possible to help her overcome her fears. Even though these are only 3 lives, but especially more difficult-to-adopt dogs block shelters and shelters sometimes need a little help from organizations who put in extra efforts to help dogs that are just more struggling to find the right loving home! You can read more about their individual success stories here and follow the blue link in above text for additional posts on social media. The municipality sends water bills to every registered Aegina citizen every couple of months. In the May waterbill, ZSP designed and sponsored a Municipality flyer that informed all citizens of Aegina about the Microchipping and Registering Initiative to reduce the stray dog count in Aegina and the lottery. This will ensure that every citizen of Aegina is aware of the ongoing initiative. The Dodo held two live streamings featuring Peter Pan on The Dodo Impact and The Dodo Twitter. Peter Pan achieved 27.8 Million views alone on The Dodo Twitter, which is an incredible result! And yes, Peter Pan got adopted soon after and is now called "Sam". See success stories. A lot of enthusiasm for the Pawject helped to get many new dogs microchipped and registered into the Municipal Dog Registry that Zero Stray Pawject is helping the Municipality of Aegina to set up. 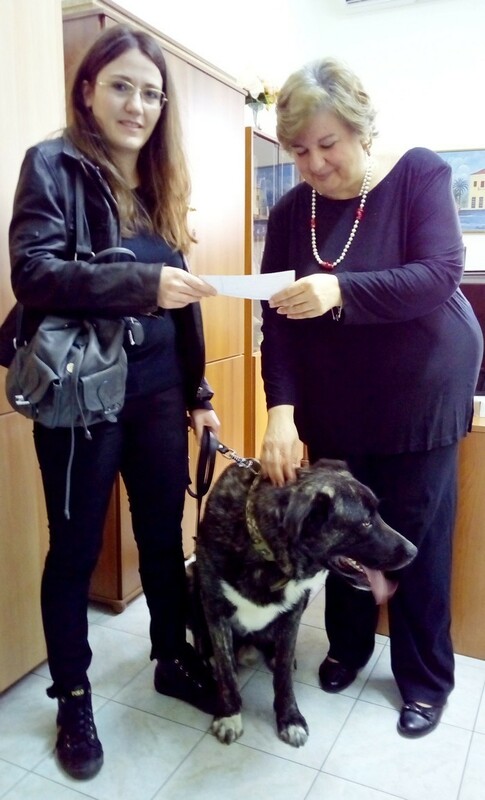 The First lucky winners who microchipped and registered their dogs according to Greek law won 200 EUR. In order to collect their check, they came into the municipality with their dog and posed for a photo with the director of public health or the mayor at the municipality. Every lucky winner gets published on the Aegina Municipality website, as well as on the ZSP/ Aegina Municipality microsite and on social media. Zoosos.gr covered our Pawject and published their article on March 10th 2018. March 1st - Street work - A day with the Group "Ghost Dogs of Aspropyrgos"
In March, we spent a day with the group of Ghost Dogs of Aspropyrgos following their daily work. Aspropyrgos is an industrial region outside of Athens and unfortunately a dumping ground for dogs. Owners who want to illegally get ‘rid’ of their dogs drive to the industrial area and leave their dogs behind. Something we are seeing too often not only in Aspropyrgos sadly. Obviously this is forbidden by law and those caught will get massive fines. It all comes back to enforcing microchipping and registering of every owned dog which will put an end to the constant illegal abandoning. A model that ZSP started to roll out in Aegina. In Aspropyrgos there is no food and there are no homes, so without the volunteers of this group many of those dogs would not survive. ZSP committed to help one of their very sick dogs Brown. Read on here. The Micro site is live informing citizens about the Pawject, why microchipping and registering is important and mandated according to the law and how easy microchipping and registering is for each individual. The Microsite also explains how the lottery works. Posters are hanging in various locations over the island to inform citizens about the microchipping and dog registry initiative as well as fines for not following the Greek law. February - The Municipality of Aegina and the Aegina Portal issue an official press release about "The Pawject"
ZSP is happy to announce that the municipality of Aegina and ZSP started our initiative to solve the stray dog problem on the island. Today Silja from ZSP met with Sofia Hatzina, Director of Public Health from the Aegina municipality. We started discussions with the municipality of Aegina in April 2017 and are happy to report that we have been helping them build their municipal dog registry since early January while the fuller incentive and marketing program is starting this month. The municipality issued a press release on the 7th of February announcing the launch of the program. ZSP will fund a lottery for every responsible dog owner who microchips and registers their dog to have a chance to win 200 EUR every 2 weeks. Dog microchipping and registration is mandatory by law. A microchipped dog cannot be abandoned. A dog with a microchip is no longer anonymous. Our program aims to encourage microchipping and to build a culture that no dog should be without a microchip. ZSP also DONATED 4 MICROCHIP READERS to the municipality of Aegina and the police in Aegina, which will soon be in use. Thanks to ZSP’s adoption efforts, eight dogs were saved, two from certain death and all of them found loving homes in 2017. Four of the eight dogs made it home from the Aegina shelter : Kassiopi, Ursa, Nelly and Adele. Two of those four dogs had waited for a long time for their home, so ZSP put all of our energy and resources to find the right home for them. Two further dogs from the eight dogs saved and homed in 2017 came from a hoarding situation. Both now live ihappily ever after and have completely transformed to be happy pups again! "Ziko" was a stray who the ZSP founders were notified about during their vacation and whom theyrsaved from abuse in Mykonos. Ziko was trying to gain the acceptance of some children but in return they often threw stones at him; their parents never intervened. Ziko now lives in in a wonderful family and can finally grow into those huge paws ! The last dog "Roxy" was pulled off the euthanasia list of ACC Brooklyn in a 48h nerve wracking marathon against time. Roxy now lives in a loving home thanks to wonderful people who responded to our plea, dropped everything, and drove to Brooklyn to adopt her just in time before she was put down. The Dodo and The Dodo Impact kindly has helped us in the past and also this time features Nelly on their Live Video streams to find a loving home. Financially, by finding monthly sponsors who make a monthly contribution; note that 100% of these contributions go to the shelter and 100% of the funds are used for dog-related and not administrative expenses. At the end of 2017, 17 Aegina dogs were sponsored through ZSP. Facilitating adoptions of dogs in the shelter to families in Europe and the U.S. In 2017, Zero Stray Pawject found homes for four of the Aegina shelter dogs who had waited for years without success of getting adopted: Kassiopi, Ursa, Nelly, and Adele. These actions to help the shelter, increase its capacity and therefore its power to solve the stray dog problem in the community. More funds allow for more dogs to be cared for, and every adoption creates a vacant space in the shelter for another dog to be taken off the street. The new Logo embodies the strength and dynamic of the Paewject model to solve the plight of stray dogs by addressing irresponsible dog ownership. It has clearer lines and shows the stray dog who Zero Stray Pawject is fighting for. Greek public opinion was shaken in November by the flash flood in Mandra that killed 21 people, wounded many others, and caused unimaginable destruction to homes and infrastructure. Animals were not spared. Stray dogs that survived the flood were left covered in mud and clay; food scraps were harder to find in the post-apocalyptic landscape. Many Greek animal welfare organizations came together to raise awareness and provide help. Zero Stray Pawject participated in one of these "action" days in Mandra (click here for details). We continued to have great discussions and are working on partnerships with other Greek, British and global animal welfare organizations to make a difference to companion animals in Greece. To this end, we attended ICAWC sponsored by Dogs Trust, the International Companion Animal Welfare conference and tied good relationships. We all have the same goal and when we partner better together, we can achieve so much more. Our philosophy is that when animal welfare organisations are working together, they can achieve much more and have higher impact. That is the reason why Zero Stray Pawject's co-founder Silja attended the "Thinking Animals United" summit in New York to meet like-minded large animal welfare organizations, such as the IFAW, WWF and others. Although the focus was very much on wild animals and large economic, health and even terrorist threats for the global economy related to animal welfare, stray dogs is a topic close to many organizations' heart. We hope that some of the ties we have built will lead to a larger impact for stray dogs in Greece. 2017 was a year of strategic refocusing: a sharper focus towards our Zero Stray mission by deploying our Zero Stray Program which addresses the root causes that lead to the problem of strays. These root causes are related to bad ownership and bad stewardship of dogs by their human owners. While shelters are a key component in achieving zero strays on the streets, there will never be enough shelters to accommodate every stray dog around the world. Even if there were shelters for every stray dog, there would never be enough families to adopt them all; so many shelter dogs would be doomed to a lifetime in a shelter. Educated guesses place the number of stray dogs worldwide as high as 600 million, and 1 million in Greece. As many as 80% are believed to have been previously owned and abandoned, as opposed to been born on the street by other strays. A stray dog's life expectancy is compromised due to multiple factors: diseases that if untreated can lead to death, the dangers of traffic, not to mention illegal activities like poisoning. While neutering of stray dogs is hugely important, it will not address the actual root cause of bad ownership. The Zero Stray Program is predicated on the promotion of responsible dog ownership at the community level: at a minimum, owners who don't abandon their dogs, nor let them roam uncontrolled outside their property, especially if they are unneutered. To promote responsible dog ownership, we partnered up with the municipality of Aegina and mayor Mr. Dimitris Mourtzis to start our Zero Stray Program. In late 2017 Mr. Mourtzis agreed with our proposal for a joint ZSP&Municipality of Aegina initiative to plan a local public policy initiative, so that stray dogs cannot be easily abandoned anymore. Since we got the mayor's green light, we have been planning with various stakeholders including the Panhellenic Animal Welfare Federation (PFO), the Aegina vets, and the office of Ms. Hatzina in the Municipality of Aegina, so that we can hit the ground running at the start of 2018. You can read more here: (Scroll down, English follows Greek). Once we start with our initiative, we will communicate more. This is step one of a four-step process. If you like to learn more about the Zero Stray Pawject concept, you can click here. A new location has been added. ZSP is evolving. Aegina is an island just a short 45-minute boat ride from Athens. Each year 200-400 dogs are abandoned. This is beyond the capacity of the shelter. As a result, many remain on the streets. Aegina's shelter is one of the best managed in Greece. It hosts over 100 dogs and finds “forever families” for about as many each year, in part thanks to a wonderful alliance with the German-based “Aegean Dogs” charity. A shelter with a high adoption rate, is only half the solution to make stray dogs in Aegina a thing of the past. The other half is working with local authorities to eradicate irresponsible dog ownership, the root cause of stays. We are already in the planning stages with the municipality. In the coming weeks we hope to launch targeted programs working hand-in-hand with their team! 3. Drafted rules that ensured the well-being of dogs in a rescue center and codified them under the "Bill of Rights"
5. Found homes - after carefully vetting families - in Greece and the US for 6 dogs and have two more dogs reserved for adoption. 6. Established a sponsorship program whereby generous sponsors pay $60/€50 per month to help alleviate the costs of their chosen dogs. At the end of 2016, Zero Stray Pawject had sponsors for 28 dogs. We also received donations in kind. The most notable was from Purina Greece that donated almost 500kg of food. 7. Instituted a volunteer program and during 2016 had two local volunteers who were helping the dogs on a consistent basis. With all those good news, we left Mykonos and the dogs in the hands of the local shelter manager as of January 3rd 2017. Subscribe to our YouTube channel by clicking on the image. December 6th: First "press coverage" with The Dodo featuring Star's adoption Live. "Star" the Greek goddess who conquered many hearts. She was discovered by an animal lover from Thessaloniki many years ago, when she endured a life on a chain at a Mykonian hotel and car rental. According to eye witnesses, she even had to give birth on the chain and was probably later on abandoned. She was then picked up by the hoarder and later on rescued by Zero Stray Pawject. Star never lost her spirit and the founders brought her to New York to find her with a home. Soon after Star was adopted by Pam in PA. With such a sad history, The Dodo got intrigued and filmed her adoption LIVE. Meet some of the faces of our sponsors. Follow us on Instagram/zero_stray_pawject and get latest news about our dogs. The two founders visited the private rescue center in Mykonos for two weeks and invited many people to the private rescue facility. Every day, a different dog was walked at the beach of Mykonos with an "adopt-me" vest on. we also started to have regular volunteers visiting the private facility in Mykonos who pet, play and walk the dogs and help to get the dogs adopted. The founders fly to Mykonos every three months to help. Amazon approved Zero Stray Pawject as qualified charity. If you sign up for Amazon Smile, Amazon will pay 0.5% of every of your future purchase to Zero Stray Pawject. So next time you buy from Amazon, go to Amazon Smile, select Zero Stray Pawject as your charity (click on the picture below, which will get you to the right landing page for signing up). Afterwards, whenever you buy anything on Amazon Smile, you are supporting Zero Stray Pawject with your purchase and help to save many more dogs' lives! What a great way of helping !!! On June 30th 2016 we have reached a milestone: Zero Stray Pawject Germany e.V. got registered in the German trade registry („Handelsregister“) as German non-profit company, headquartered in Berlin, delivering tax benefits to German donors. Zero Stray Pawject Germany e.V. is a sister company of Zero Stray Pawject Inc, a 501(c)3 US non-profit entity, headquartered in New York City. The rest of our dogs move to our new private foster facility, where they are living according to "The Bill of Rights", without chains, stress-free, paired according to temperament, with lots of space.See for example Tyson who needs a special kennel as he does not get along with other dogs. This allows everybody who wants to help, to send their donation easily to Zero Stray Pawject and either become a monthly sponsor or contribute with a one-off donation. Follow us on Facebook and give us your feedback what you like to see more of Zero Stray Pawject. We will bring you the latest news in real time and stay connected with you. Zero Stray Pawject is now a 501(c)3 tax exempt Nonprofit organization, as certified by the US Internal Revenue Service, providing donors and sponsors in the US with tax benefits. Zero Stray Pawject traveled to Mykonos to inspect the foster facility’s progress and invited an experienced dog trainer to evaluate the dogs. March 14th: Founding summit of Zero Stray Pawject Germany e.V. Founding summit of Zero Stray Pawject Germany in Berlin, a German tax exempt legal nonprofit association. Signing of Nonprofit legal papers to be registered into the German “Handelsregister” (trade registry) as an ‘eingetragener Verein (e.V. )’, which is the legal form of a Nonprofit entity in Germany. This provides tax benefits to sponsors and donors in Germany. Registry will be approved by German governmental bodies within a timeframe of 4-6 months. 2 weeks after launch and with a targeted marketing approach to friends and family, Zero Stray Pawject managed to attract 20 sponsors. Each sponsor chose a dog from the website and agreed to provide their dog with financial stability (filling their daily food bowl, providing clean water daily, providing their dog with basic tick-flee prevention and paying for keeping their dog’s living area clean). Stray Pawject launched, starting with a focus on Mykonos, Greece. ZSP’s Website went live that day, providing background on its mission, the “bill of rights”, its dogs, success stories and content why strays are ending up on the street, why adopting is better than buying and how every responsible citizen can help. The objectives of the website are to get as many of the dogs sponsored and eventually adopted as well as to raise awareness. Zero Stray Pawject’s Fostering facility made good progress. Half of our dogs moved to Tigani. Tigani is not a shelter but a private super-foster facility, affectionally called “Lemonia’s Garden”. The dogs are housed on private property, leased by Lemonia and every dog is legally owned by Lemonia (all dogs are chipped and registered to Lemonia on Greece’s Ministry of Agriculture pet ownership database). The dogs live according to “the bill of rights”, which provides even tougher and more specific guidelines for housing dogs than the Greek animal welfare law does. Note: Zero Stray Pawject supports foster families and foster facilities owned by private people who are trying against all odds to help stray dogs, where municipalities ignore the problem despite their legal obligation to collect strays and shelter them. Zero Stray Pawject’s co-founder Silja rescued four dogs during her business and personal travels in 2015. She got stray dogs off the street into safety and worked with local shelters and fosters for temporary housing, returned to the locations after finding a loving family and transported each dog herself by plane into their new homes. She stays in touch with each family. During thοse rescue missions, Silja had the chance to speak with local shelters and fosters about their daily struggle to save stray and abandoned dogs. After this experience Silja and Theo decided to create a more systematic solution, which can help hundreds, thousands, and maybe more dogs worldwide.